Create the quote and enter the items to be worked on (at this stage you don't need to enter prices - you can enter those once you have a list of all the parts required). Print and/or email the parts list to your supplier(s) for pricing. Enter the pricing (using the Change button). Finalise the quote (once you have all the part prices entered) and print/email to the customer/assessor/insurer. Approve the quote (once the customer/assessor/insurer has approved the quotation). 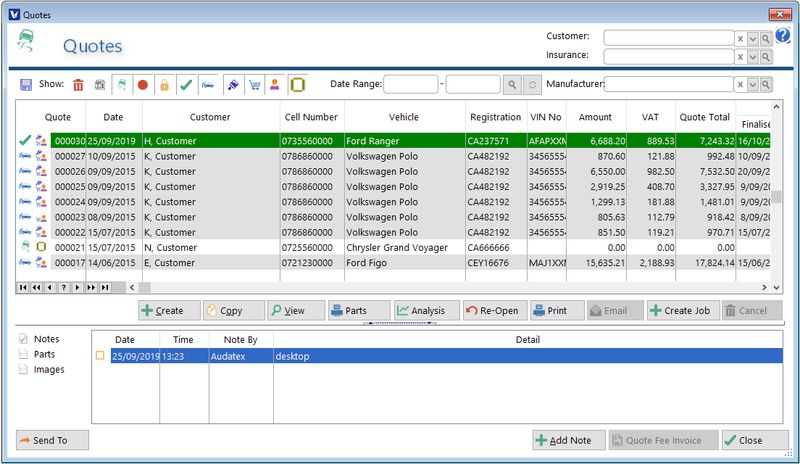 Quotes can be generated, printed, finalised, approved, edited and analyzed by accessing the Quotes icon in the Work Menu. The first time you open the Browse Quotes window, the Legend for quotes window will be displayed. This legend indicates colours used for the status of a quotation. 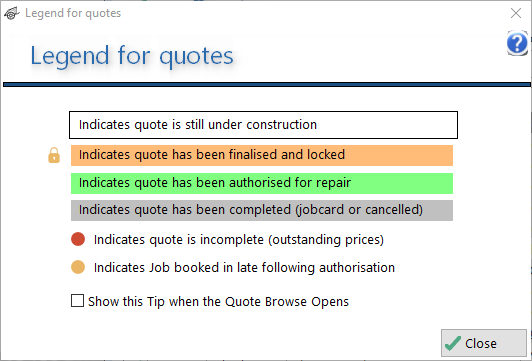 This window can be set to display everytime the Browse Quotes window opens or you can simply access this when needed by clicking on the What do the colours mean? button.